At the recent Research and Innovation Awards presentation dinner, Charles Darwin University was well represented among the winners and finalists. 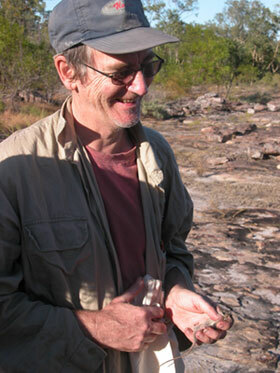 Adjunct Professorial Fellow with the School for Environmental Research at CDU, and representative of NRETA, John Woinarski (pictured), won the Tropical Knowledge Research Award for his contribution to biodiversity conservation in northern Australia. John Woinarski’s efforts also won him the top award of the evening, the Chief Minister’s Award for Research and Innovation 2008. The prize was $5000 and a unique trophy handcrafted by a Territory glass artist. The McArther River Mines Indigenous Innovation Award was won by the Indigenous Microbusiness Information Technology Team, who worked in collaboration with Lorna Murakami-Gold, of CDU, to set in place computers, software and training for Indigenous community microbusinesses. The winner of the Desert Knowledge Research award was the Desert Fire Research Team, who worked in partnership with CDU to investigate fire management issues in desert Australia. A collaborative team from CDU’s Faculty of Education, Health and Science and Northern Territory Government department Natural Resources Environment and The Arts (NRETA), were finalists for the Tropical Knowledge Research Award. The weed ecology and risk management research team comprised Dr Samantha Setterfield, Associate Professor Michael Douglas and Dr Lindsay Hutley, from CDU, and Dr Keith Ferdinands, a CDU graduate and NRETA representative. Dr Shelley Walton, and Alice Rumbold, both from CDU’s Menzies School of Research, were shortlisted for Tropical Knowledge Research and AusIndustry New Generation Research and Innovation awards respectively. The awards evening was held at the Holiday Inn Esplanade on May 29, on the eve of the CDU May 2008 Symposium.